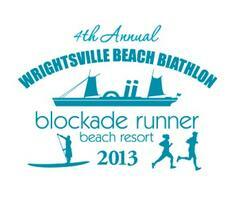 The Fourth Annual Wrightsville Beach Biathlon will take place on Saturday March 23rd, 2013. Hosted by the Blockade Runner Resort, the event combines a 4-mile beach run with a challenging SUP course. With the option of participating in a relay format, the biathlon is open to teams and individuals. The fun begins on Saturday morning with a 4-mile paddle around Money Island and back to the Blockade Runner. Next, it's time to ditch the SUP gear and hit the ground running from the Blockade Runner's beachfront and northward to Johnny Mercer's Pier, where the course turns back for a southward sprint to Crystal Pier. First finishers to the Blockade Runner will be awarded with weekend passes to the resort, plus sponsor donated prizes. After the awards ceremony, participants and their families will gather at the resort's oceanfront patio for refreshments and a hamburger cookout. The Biathlon is scheduled rain or shine for 10:30 am on Saturday, March 23rd. Biathletes will be pleased to learn that the Blockade Runner is extending a special discount and providing a complimentary breakfast before the race. After all that time spent at the gym this winter, isn't it time to put your skills to the true test? Event sponsors, Coastal Urge and Natty Greene Brewing Company are making it even more worthwhile with a number of prizes for a job well done! For more information on this event, including the course, how to register, and accommodations at the Blockade Runner, Please visit this link: http://wbb.eventbrite.com/.